Cereal is one of the most popular commercially sold foods available on the market today. Walk down the cereal aisle at your local grocery store and you will be bombarded with different cereal types that vary in flavor, taste, texture and nutritional value. 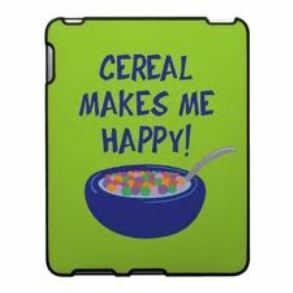 Cereal is most well-known as a breakfast food that provides fuel for the day ahead. However, this popular food item can be eaten any time of the day and is often enjoyed as an afternoon or late-night snack. Check out the following top ten popular cereals and pick up a new box to try today! 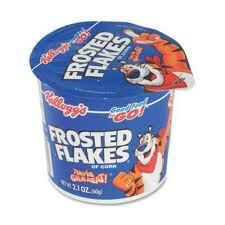 Frosted Flakes is one of the most popular cereals sold today and is well-known for its mascot, Tony the Tiger. Kids love this cereal because of the sweet taste imparted while adults enjoy eating it in moderation as part of a healthy diet plan. 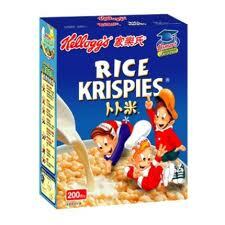 Popular cereals that make it big in the food industry are usually those with a marketing catch or gimmick. 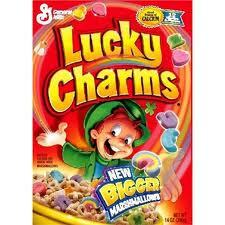 Lucky Charms boasts a little green leprechaun man that talks about his ‘lucky charms’ in a thick Irish accent. The combination of whole-grain pieces with colorful marshmallows makes it a favorite amongst foodies. Raisin Bran is probably most well-known for its ability to help keep the digestive system running smoothly thanks to its higher fiber content. 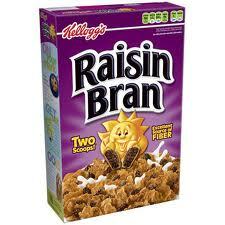 Although it has been revered has a health food, keep in mind that Raisin Bran is high in sugars thanks to the natural sugars found in raisins. Some brand names may add sugar to the cereal so read nutritional labels carefully. 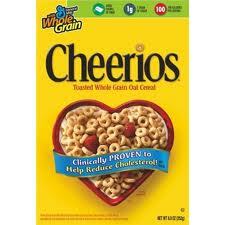 The bright yellow box has made a Cheerio’s a popular cereal stand-out for kids and adults worldwide. Made with whole-grain ingredients, cheerio’s also comes in a variety of spin-off flavors including the original plain Cheerio’s, Honey Nut Cheerios, Apple Cinnamon Cheerios, Frosted Cheerios and, most recently, Chocolate Cheerios! Rice Krispies are a low-calorie, low-fat cereal made from rice that helps keep breakfast simple without any fancy additions. Recently, Kellogg’s has come out with a Vanilla Rice Krispies cereal for flavor variation as well as gluten-free version for those who cannot eat foods made with or in contact with wheat and gluten. 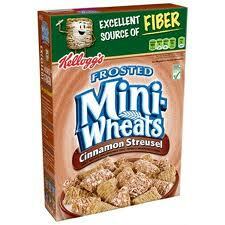 It’s hard to resist any food that is frosted including that of Kellogg’s Frosted Mini Wheats. Although this cereal is higher in sugar at 12 g per serving compared to typical recommendations of 10 g, it does have 6 g of fiber per serving and whole-grains listed as the food ingredient. Enjoy this cereal in moderation or as a treat from your usual healthier breakfast rotation. Post hit the cereal jackpot with Honey Bunches of Oats which comes in a variety of flavors including peach, honey apple and strawberry. Post describes the original Honey Roasted flavor as the ideal combination of crunchy oat clusters, crisp flakes and a touch of honey. 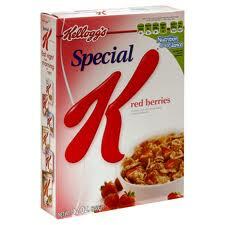 Special K has been around for decades and continues to be amongst the popular cereals to this day. The tiny bite-size rice puffs are marketed for being low in calories and fat, thus potentially assisting in a weight-loss program. 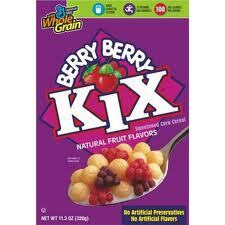 Kix is a healthier cereal alternative to other breakfast cereals and foods that are high in sugar. Kids will love the taste while parents appreciate that whole-grain corn is listed as the first ingredient. A serving of Kix has only 3 g of sugar per serving, provides a digestive boost with 3 g of fiber and contains approximately 45 percent of the recommended daily value for iron! Kashi has become an increasingly recognizable brand name in food stores today as they sell cereals, cookies, crackers, oatmeal and granola bars. 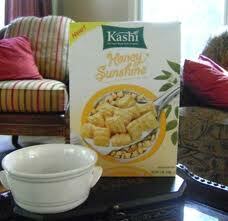 Pick up a box of Kashi Honey Sunshine during your next grocery run. 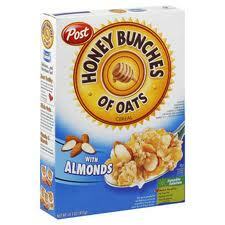 The sweet honey taste will satisfy the palette while the 20 go of whole grains per serving will satisfy the body.